President Viktor Yushchenko - the one-time hero of Ukraine's Orange Revolution - has seen his support evaporate in the past five years, and opinion polls suggest he has almost no chance of winning this Sunday's presidential election. Ukraine's first presidential election since the revolution, the poll marks a pivotal round of Mr Yushchenko's power struggle with Prime Minister Yulia Tymoshenko - his former ally during the mass street protests in 2004 that swept his pro-Western coalition to power. It also renews his battle with main opposition leader Viktor Yanukovych, whose victory in 2004 was ruled fraudulent. 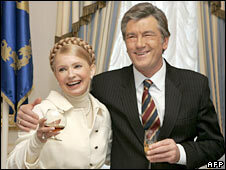 Mr Yushchenko has accused Mrs Tymoshenko of destroying the Orange coalition through her "thirst for power". Their relationship has completely broken down, and their political squabbling has paralysed decision-making in Ukraine at a crucial time, when the financial crisis has devastated the country's steel industry and banks have collapsed. Despite his strong record as an economist, many blame Mr Yushchenko for Ukraine's predicament. The country has been forced to accept billions of dollars in IMF aid - but some of that has been withheld because the country has failed to push through economic reforms. He has also been blamed, by some, for the gas disputes with Russia that have seen supplies cut twice in three years. Russia has made no secret of its dislike for Mr Yushchenko, who has pursued a firmly pro-Western policy, aimed at membership of Nato and the European Union. Russian President Dmitry Medvedev has condemned Ukraine's "anti-Russian" course and says he looks forward to better relations under a new president. Meanwhile Nato and the EU have gone cool on the idea of Ukrainian membership, leaving Mr Yushchenko seemingly without strong strategic allies. Once a cautious and loyal technocrat who had been trained as an accountant, he drew Western admiration after leading some of Ukraine's bravest reform efforts in President Leonid Kuchma's quarrelsome governments in the 1990s. Later he broke ranks with Mr Kuchma to form the Our Ukraine opposition bloc. For many he represented a historic chance to forge new ties between Ukraine and the West. Mr Yushchenko says his poisoning in 2004 nearly killed him. Despite some improvement by 2008, scars on his face are still clearly visible. Mr Yushchenko is not a "Zapadenets" - a native of western Ukraine, where pro-European and anti-Russian sentiment is strongest, and where he enjoys the highest support. In fact, he was born in the Sumy region of north-eastern Ukraine, on the border with Russia, in 1954. He hails from an agricultural and predominantly Ukrainian-speaking area. In that respect he differs from many of his opponents, whose native tongue is Russian. After university he pursued a financial career, starting as a village accountant and then gradually moving to much higher posts in the former Soviet Ukraine's banking system. In 1993 he became head of the national bank of the newly independent Ukraine. Under his guidance, Ukraine moved from hyperinflation and surrogate money to the hryvnya - the country's own, fairly stable currency. After managing to reduce the impact of the Russian debt default in 1998, Mr Yushchenko was appointed Ukrainian prime minister by President Kuchma. As the country's economy improved, with salaries and pensions paid on time and corruption reduced, nobody doubted the prime minister's loyalty to the president. The liberal and nationalist opposition urged him to become their leader, but Mr Yushchenko remained, at least officially, on the presidential side. However, his popularity across the country sharply contrasted with Mr Kuchma's tiny ratings, and in 2001 the president dismissed him, staking all on the support of industrial groups based in eastern Ukraine and Moscow. Freed from the forced alliance with the president, Mr Yushchenko soon accepted the opposition leadership offer. He became head of the Our Ukraine bloc, which at the next parliamentary election managed to gain enough votes to seriously challenge the authorities. Mr Yushchenko started the 2004 presidential campaign as Ukraine's most popular politician, and it took an enormous propaganda effort on state-run TV channels to make his rival, Prime Minister Yanukovych, look like a real contender. 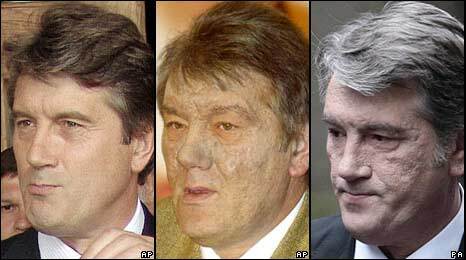 There were numerous attempts to discredit Mr Yushchenko, but nothing had a greater impact than his poisoning, which left scars and blisters on his face weeks before the crucial vote. His team said it was yet another dirty trick by his opponents. Following Mr Yanukovych's official victory - which observers said had been rigged - Mr Yushchenko launched the Orange Revolution protests, making it clear that it was a "velvet revolution" against the Moscow-influenced elite that he had in mind. 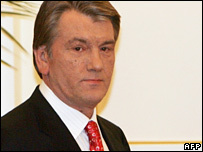 After the Supreme Court annulled the official result, Mr Yushchenko won a re-run and took over the presidency in January 2005, promising to deliver radical political change. But he has been hamstrung by his alliance-turned-rivalry with Mrs Tymoshenko, which has left him with few allies in parliament, and his management of the country has left his former supporters disillusioned.